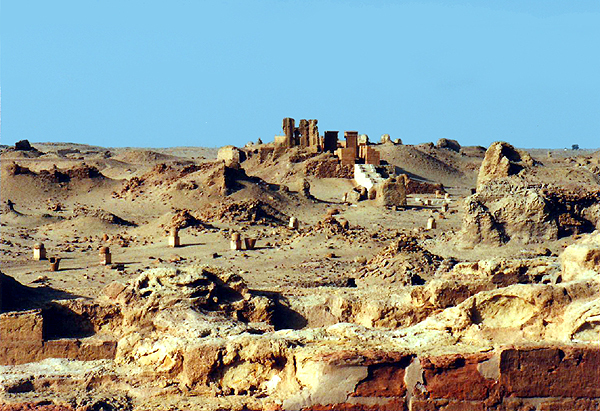 The Greco-Roman agricultural town of Karanis, in the Faiyum oasis, was founded by Ptolemy II Philadelphus as a settlement for Greek veterans discharged from his army upon completion of their service. This kind of "veteran's benefit" was normal and expected in the Hellenistic and Roman world. Three temples were built in Karanis, to serve a population of about 3,000. Karanis was excavated by Francis W. Kelsey, of the University of Michigan, between 1926-1935. The Kelsey Museum website records the excavation and recovered artifacts. See also Tour Egypt for additional photos and information.